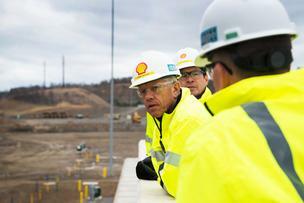 Graham Hoff, Executive Vice President for Royal Dutch Shell’s global Chemicals business, at the site of the ethane cracker project in Potter Township, Beaver County. The company will host two career events in partnership with Community College of Beaver County. The Community College of Beaver County will host two events next week in partnership with Shell to highlight jobs available at the $6 billion-dollar ethane cracker plant under construction in Potter Township. On Oct. 12, a career forum called Shell Pennsylvania Chemicals Military Petrochemical Day will be held from 8 a.m. to 2 p.m. in room 9103 of CCBC’s Learning Resources Center. The event is open to former service members and will describe the cracker plant project, skills transferable to jobs there, the application process and educational scholarship opportunities. The second event that day at 6 p.m. in the CCBCÂ Dome is a free career expo, open to the public, designed to inform residents about all the current and emerging job opportunities. An estimated 6,000 workers from building and construction trades will be needed during the cracker plant’s construction phase, expected to last through the second half of 2021. Once operational, 600 permanent full-time jobs are expected to remain at the plant in career areas such as process technology, engineering and maintenance. Veterans can register online for the Shell Pennsylvania Chemicals Military Petrochemical Day. For the career expo, interested attendees are also encouraged to RSVP online. http://triblive.com/news/beaver/8314036-74/plant-shell-beaver#axzz3ZMkv87Bn This article does not mention en estimated 20 speakers who were in favor of the Cracker Facility. The Beaver County Chamber of Commerce, Allegheny Conference, and the Beaver County Commissioners were among those testifying for the cracker plant but not recognized in this article.